The marathon was difficult to say the least. When I originally committed to run the International Peace Marathon in the lushly green capital city of Kigali, I did not anticipate that there is virtually no flat space to speak of. Everyone warned us of the altitude—Kigali sits at approximately 5,000 ft above sea level—but in addition we also gained 2,300 feet in elevation over 26.2-miles. The 80 plus degree heat was also a feat to be reckoned with. The Sisters Coffee team did not outrun the Kenyans that day, who completed the marathon in nearly half the time, but we did learned a valuable lesson about running in The Land of a Thousand Hills. The marathon was a fantastic and overwhelming experience, even if our times weren’t as impressive as we’d hoped. 4,000 people travel to Kigali every year to compete in the International Peace Marathon, which is an initiative to fight genocidal ideology in Rwanda. As we ran up and down the twisting city roads, we were encouraged by what felt like cheers of the whole city. While in Kigali we also had the opportunity to visit the second largest dry mill in the country, CBC, which exports 20 tons of Rwandan Coffee every year. 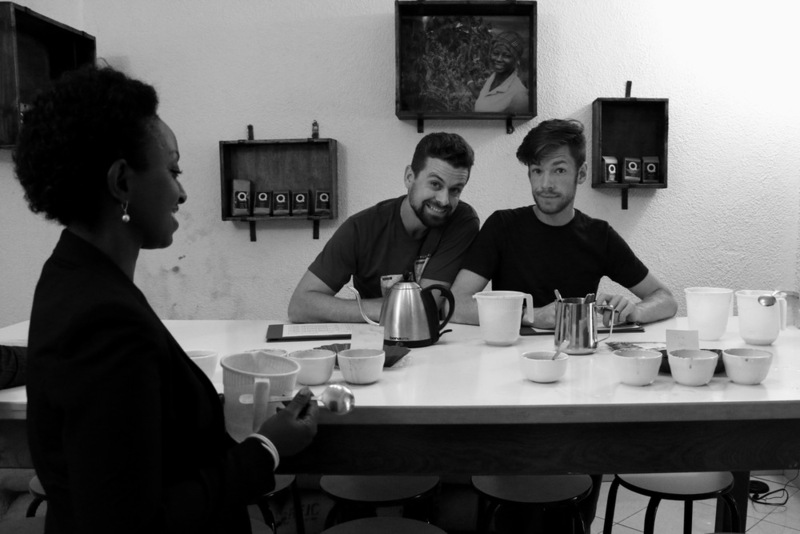 The mill managing director, Damascene, graciously spent the morning with us, chatting casually about both the wonderful and sometimes challenging experiences that come along with working in coffee in Rwanda. As we passed various warehouses filled with workers attentive to sorting and operating equipment, Damascene’s eyes lit with excitement as he shared his dreams to grow the mill. 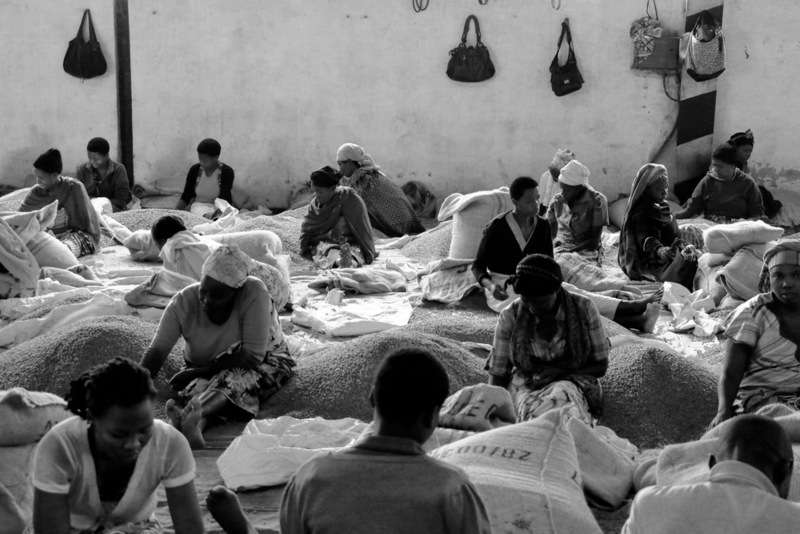 He brought us to an open-air warehouse where approximately 400 women sat enveloped in a blanket of green coffee beans, wrapping around them as they sorted the beans into different piles. Every bean in the mill is sorted by hand. Damascene informed us that at the height of the Rwanda coffee harvest, around June/July, the mill produces 600 bags a day, or 79,200 pounds, all sorted by hand, one bean at a time. The unbelievable amount of labor that is required to produce a cup of coffee never ceases to astound anyone who will be curious enough to learn about it. On Monday we hopped in a rickety SUV and traveled south for 3 hours through the never-ending hills in the Rwandan countryside. The cooperative we work with, Nyampinga, is situated in the Nyaruguru district of Rwanda, near the town of Huye. Upon arrival, we were greeted by two agronomists working closely with the Nyampinga cooperative, Eric and Fabien. Their contribution to the Nyampinga cooperative was immediately evident; not only do they possess the knowledge and experience that is required to grow high quality coffee, but they also deeply believe in the professional and personal development of the women that work at the Nyampinga cooperative. We settled into our small quaint hotel, and soon made friends with the warm hotel staff. Then early in the morning, we climbed into our SUV and started the long winding drive to the cooperative. The farm and washing station were about an hour’s journey from Huye, on a rich red dirt road that cut through lush green hillsides of maize and all kinds of agriculture. The road was an undulating journey, climbing mountainsides and gaining elevation followed by slow descents into valleys laden with grass fields and rivers. Approaching the Nyampinga plot, we were greeted by 20 women wearing brightly colored dresses and singing their own Nyampinga song. In the region, it is not uncommon for a cooperative to have their very own anthem, one that depicts the originalities of their community. After a spirited greeting filled with plenty of smiles and hugs, we walked on a trail through a small valley, crossing a creek and up a hillside to the washing station. Upon arrival, we were greeted by more women, all singing the same Nyampinga song. Visiting a coffee farm in Rwanda is a lively and ceremonial experience. The women were very proud to show us their quality control systems, as everyone in the cooperative is strongly committed to harvesting and processing coffee that will produce the highest quality cup possible. They have also recently learned how to home roast, a practice that is not always prevalent at the farms. Using a ceramic pot over a fire, we roasted a small batch of fresh green beans and enjoyed the first round of coffees that were harvested on the farms this year. On the last day, we returned to the lab at Sustainable Harvest in Kigali to cup and score the new 2016 harvest. Christine, the Rwanda program director at SH, cautioned that these were the first samples of the year and that they were still expecting the best coffees to arrive later in the season. We smiled in return, scoring the Nyampinga coffee at an 85, as the aromas and flavors of dried apricot and glistening stone fruit prevailed through the cup. Now, we’re on a plane to Tanzania with the next post coming soon.